Oliver Schwall, managing director of the Sailing Champions League which has contact with individual national leagues across the world, has signed the charter. “Behind the Sailing Champions League and the International Sailing League Association are up to 300 sailing clubs from 15 countries who have more than 150,000 members. “This give us a great opportunity to make the ideas of the Charta Smerelda known throughout Europe,” he said. The charter will be published at a conference run by Costa Smerelda yacht club in Milan on Tuesday and Wednesday. raising public awareness of marine litter and pollution and the need to reduce it. Data from the Ellen MacArthur foundation show the scale of marine pollution. The foundation in a report in 2016 revealed that every year more than 8m tonnes of plastic are leaked into the ocean. Up to 40% of the world’s oceans are heavily affected by human activities causing pollution, loss of coastal habitats and depleted fisheries, according to the UN’s sustainable development goals. By 2050 there will be more plastic in the ocean than fish by weight, according to the Ellen MacArthur foundation. New figures revealed by the Guardian showed a million plastic bottles are bought across the world every minute. By 2021 purchase of plastic bottles will rise by 21% to 583bn bottles across the world. President Emmanuel Macron and Mawlana Hazar Imam in conversation upon arrival at the Élysée Palace. 18 September 2018 - Paris, France: President Emmanuel Macron today received Mawlana Hazar Imam at the Élysée Palace in Paris - the official office and residence of the President of France. A guard of honour by the Republican Guard was on display, as Hazar Imam was welcomed by the French President. The Minister for Europe and Foreign Affairs will receive Karim Al Hussaini, Aga Khan IV, today. This meeting will notably provide an opportunity to take stock of the partnership agreement signed 10 years ago between the Ministry for Europe and Foreign Affairs, the French Development Agency (AFD) and the Aga Khan Development Network. The Aga Khan Foundation is a partner with which several ambitious projects have been implemented in Africa, Asia and the Middle East, notably in the education and health sectors, such as the extension of the French Medical Institute for Children (FMIC) in Kabul and in the energy sector, with the Bujagali hydroelectric power plant in Uganda. The Aga Khan Foundation is also involved in the development of the Domaine de Chantilly, helping this cultural heritage site to assume its rightful place. It therefore makes a valuable contribution to showcasing French heritage and to promoting our country abroad. In recognition of his commitment to France, the minister will bestow the insignia of the Grand Cross of the National Order of the Legion of Honor upon the Aga Khan this evening. Le ministre de l’Europe et des affaires étrangères reçoit aujourd’hui Karim Al-Hussaini dit Karim Aga Khan IV. Cette rencontre sera notamment l’occasion de faire un point sur la convention de partenariat signée il y a dix ans entre le ministère de l’Europe et des affaires étrangères, l’agence française de développement (AFD) et le réseau Aga Khan pour le développement (AKDN). La Fondation Aga Khan est un partenaire avec lequel des projets ambitieux ont été réalisés en Afrique, en Asie et au Moyen-Orient, notamment dans les secteurs de l’éducation et de la santé, comme l’extension de l’Institut médical français pour l’enfant de Kaboul (IMFE), ou de l’énergie avec la centrale hydroélectrique de Bujagali en Ouganda. La Fondation Aga Khan est également engagée dans le développement du domaine de Chantilly, contribuant à rendre à cet ensemble patrimonial et culturel la place qui est la sienne. Elle apporte ainsi une contribution appréciée à la mise en valeur du patrimoine français et au rayonnement de notre pays à l’étranger. En reconnaissance de son engagement à nos côtés, le ministre remettra ce soir à l’Aga Khan les insignes de Grand-croix dans l’Ordre national de la Légion d’honneur. Le ministre de l’Europe et des affaires étrangères a reçu Karim Al-Hussaini dit Karim Aga Khan IV. Cette rencontre a été notamment l’occasion de faire un point sur la convention de partenariat signée il y a dix ans entre le ministère de l’Europe et des affaires étrangères, l’agence française de développement (AFD) et le réseau Aga Khan pour le développement (AKDN). La Fondation Aga Khan est un partenaire avec lequel des projets ambitieux ont été réalisés en Afrique, en Asie et au Moyen-Orient, notamment dans les secteurs de l’éducation et de la santé, comme l’extension de l’Institut médical français pour l’enfant de Kaboul (IMFE), ou de l’énergie avec la centrale hydroélectrique de Bujagali en Ouganda. En reconnaissance de son engagement à nos côtés, le ministre a remis à l’Aga Khan les insignes de Grand-croix dans l’Ordre national de la Légion d’honneur. The Aga Khan’s contributions to the preservation of French heritage were also recognised. He is Founder and President of the Fondation pour la sauvegarde et le développement du Domaine de Chantilly which has made a significant contribution to the conservation and restoration of the domain, including the Château of Chantilly. The Grand-croix de la Légion d’honneur is the highest French Medal of Honour and was established in 1802 by Napoleon Bonaparte. Previous recipients include Prince Charles, Emperor Akihito (Japan), King Willem-Alexander (Netherlands), Václav Havel (Czech Republic), King Hussein (Jordan) as well as French presidents and former prime ministers. France President Emmanuel Macron yesterday awarded His Highness the Aga Khan, the Grand Cross of the Legion of Honour (La Grand-croix de la Légion d’honneur), in recognition of his contribution to humanity and achievements in improving the quality of life of the most vulnerable populations around the world. 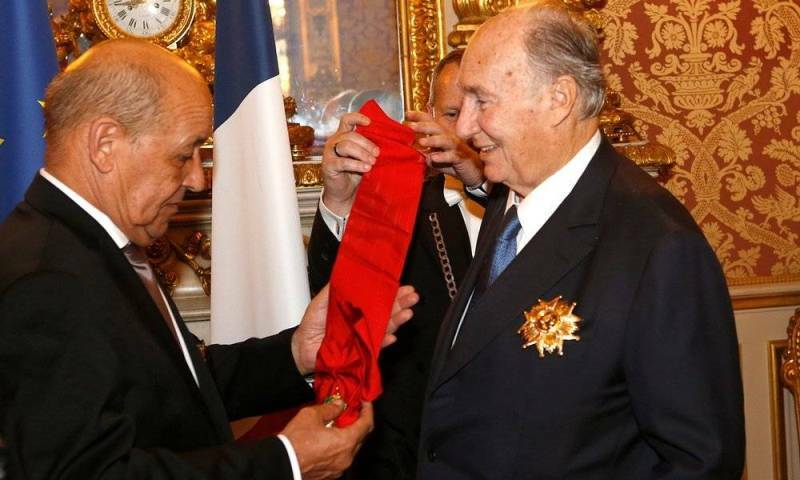 France's highest national medal of honour was bestowed upon the Aga Khan at a ceremony at le Quai d’Orsay by France’s Minister for Europe and Foreign Affairs, Jean-Yves Le Drian in commemoration of the Aga Khan’s Diamond Jubilee, commemorating 60 years as Imam (spiritual leader) of the world’s Shia Ismaili Muslim community. The event was part of a two-day visit in honour of the Aga Khan’s life’s work. 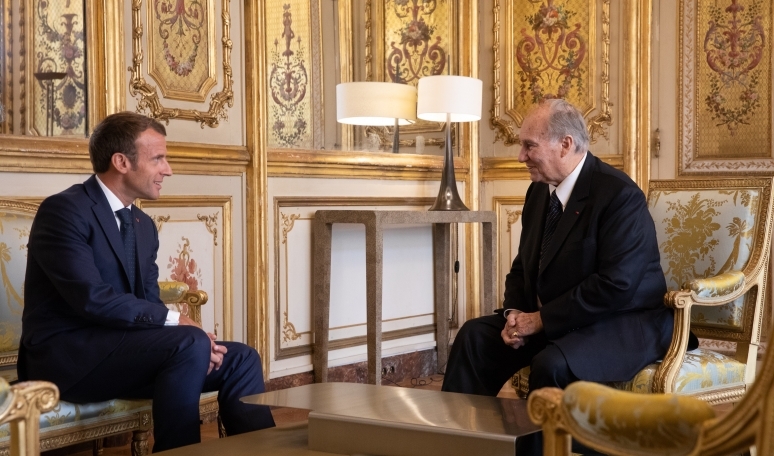 On September 18th, President Macron received the Aga Khan at the Élysée Palace – the official office and residence of the President of France – where the two leaders discussed development initiatives in parts of the world where the Imamat and France collaborate as well as regional issues of importance. In expressing his deep gratitude for the honour bestowed upon him, the Aga Khan spoke about the importance he placed on a partnership he felt was built on shared values. “For years, we have worked together in different fields, in France, abroad and always in a close partnership, of common points of view, of common objectives and, above all, respect for all the great values of France. For me this partnership is particularly important. It is a partnership built on historical values. And these historical values have proven themselves around the world. These are values of French origin, but which today are universal values,” he said. 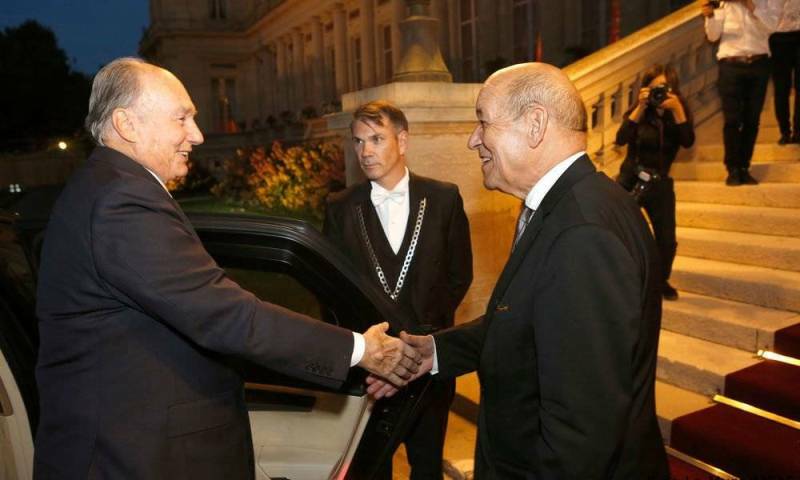 The award ceremony was followed by a dinner hosted by the French government in honour of the Aga Khan, and attended by government officials and leading members of French social, economic and cultural civil society organisations. 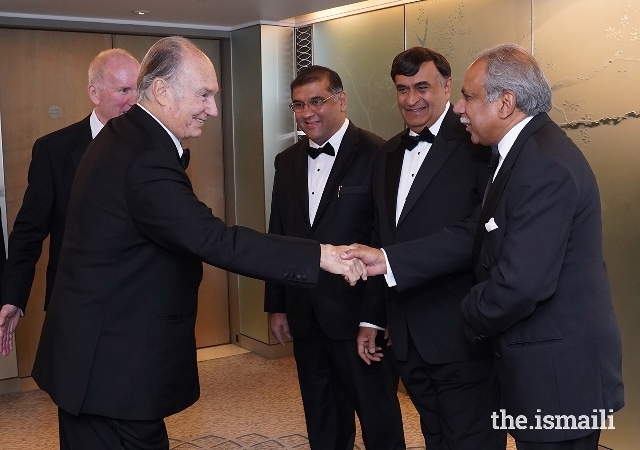 Members of His Highness’ family – his brother Prince Amyn, his son Prince Rahim and his daughter Princess Zahra – were also in attendance together with senior leaders from the Aga Khan Development Network (AKDN) and the Ismaili community. French Minister Le Drian and the Aga Khan also had a bilateral discussion on further strengthening the partnership between the Government of France and the Ismaili Imamat, notably through AKDN, a network of agencies committed to improving the quality of life of the most vulnerable people through economic, social and cultural development activities globally. The occasion also marked the tenth anniversary of the 2008 cooperation agreement between the AKDN and the French Government recognising their common vision for development – the necessity of long-term engagement, the participation in development of local communities and the importance of integrating economic development with social development. Initiatives led by the AKDN in collaboration with Agence Française de Développement (AFD), France’s development agency, and other French agencies in the areas of health, education, infrastructure and rural development have made a significant impact on the quality of life of the most vulnerable people in Africa and Asia. Examples of this collaboration include the Heart and Cancer Centre at the Aga Khan University Hospital in Nairobi, Kenya; support to the French Medical Institute for Mothers and Children (FMIC) in Kabul, Afghanistan; support for health services in Dar es Salaam, Tanzania; the Bujagali Hydropower plant, which today provides almost half of Uganda’s electricity; and the establishment of Roshan, the first, and largest, mobile telephone provider in Afghanistan. President Emmanuel Macron and His Highness the Aga Khan after their meeting at the Élysée Palace. The award is in recognition of the Aga Khan’s Diamond Jubilee, commemorating 60 years as Imam (spiritual leader) of the world’s Shia Ismaili Muslim community. The occasion also marked the 10th anniversary of the collaboration agreement between the Aga Khan Development Network and the French government signed in the 2008. The collaboration between AKDN and the French Development Agency covers health, education, infrastructure and rural development. It has made a significant impact on the quality of life of the most vulnerable people in Africa and Asia. 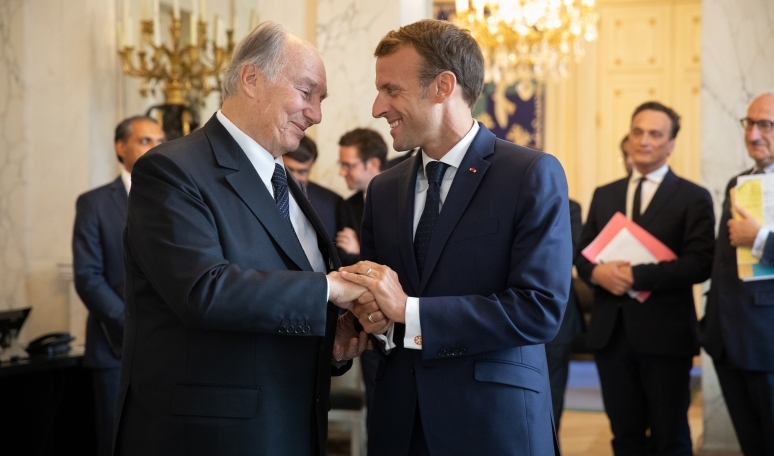 France has awarded His Highness the Aga Khan, the country’s highest national medal of honour in recognition of his efforts to improve the quality of life for the most vulnerable people around the world. Presenting the award on behalf of President Emmanuel Macron on September 19, France’s Minister for Europe and Foreign Affairs, Jean-Yves Le Drian, praised His Highness’s commitment to the cause of peace, pluralism and development. “France wishes to warmly express its gratitude by elevating you to the dignity of the Grand Cross in the order of the Legion of Honour. On behalf of the president of the republic, and by virtue of the powers conferred upon me, we bestow you the dignity of the Grand Cross of the Legion of Honour,” said Mr Le Drian. The award ceremony was followed by a dinner hosted by the French government in honour of the Aga Khan. In attendance were government officials and leading members of French social, economic and cultural civil society organisations. Members of His Highness’s family — his brother Prince Amyn, his son Prince Rahim and his daughter Princess Zahra — were also in attendance together with senior leaders from the Aga Khan Development Network and the Ismaili community. Key examples include the Heart and Cancer Centre at the Aga Khan University Hospital in Nairobi, Kenya; support for the French Medical Institute for Mothers and Children in Kabul, Afghanistan; support for health services in Dar es Salaam, Tanzania; the Bujagali hydropower plant in Uganda; and Roshan, the first and largest mobile telephone provider in Afghanistan. The Aga Khan said he attached a lot of importance to the partnership as it was built on shared values. The Aga Khan’s contributions to the preservation of French heritage were also recognised. He is founder and president of the Foundation pour la Sauvegarde et le Développement du Domaine de Chantilly, which has made a significant contribution to the conservation and restoration of the domain, including the Château of Chantilly. The Grand-Croix de la Légion d’Honneur is the highest French Medal of Honour and was established in 1802 by Napoleon Bonaparte. Previous recipients include Prince Charles, Emperor Akihito (Japan), King Willem-Alexander (Netherlands), Václav Havel (Czech Republic), King Hussein (Jordan) as well as French presidents and former prime ministers. 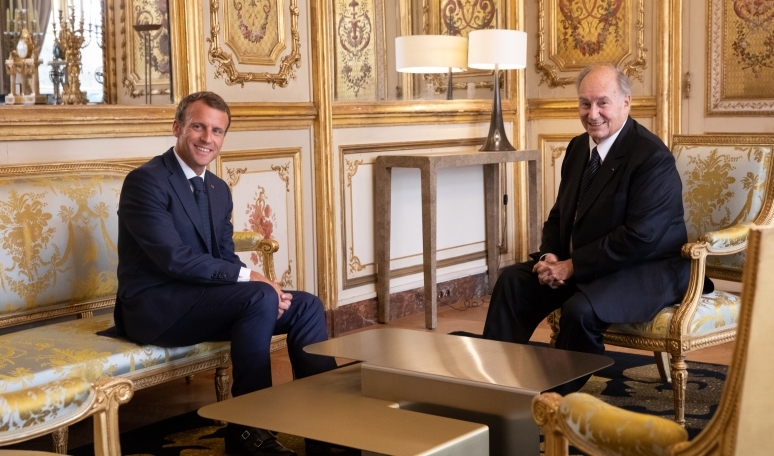 President Emmanuel Macron on September 19 awarded Prince Shah Karim Al Hussaini Aga Khan, the Grand Cross of the Legion of Honour in recognition of his contribution to humanity and achievements in improving the quality of life of the most vulnerable populations around the world. The Grand-croix de la Légion d’honneur is the highest French Medal of Honour and was established in 1802 by Napoleon Bonaparte. Previous recipients include Prince Charles, Emperor Akihito (Japan), King Willem-Alexander (The Netherlands), Václav Havel (The Czech Republic), King Hussein (Jordan) as well as French presidents and former prime ministers. Aga Khan spoke about the importance he placed on a partnership he felt was built on shared values. 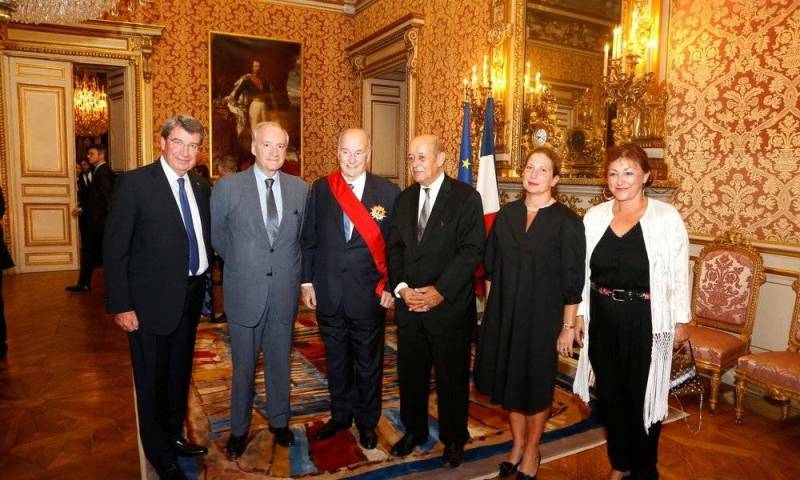 The award ceremony was followed by a dinner hosted by the French government in honour of the Aga Khan, and attended by government officials and leading members of French social, economic and cultural civil society organizations. 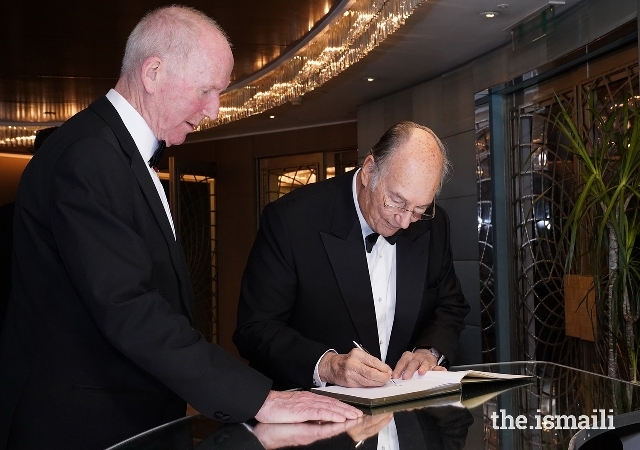 Members of his Highness’ family – his brother Prince Amyn, his son Prince Rahim and his daughter Princess Zahra – were also in attendance together with senior leaders from the Aga Khan Development Network and the Ismaili community. The event was part of a two-day visit in honour of the Aga Khan’s life’s work. 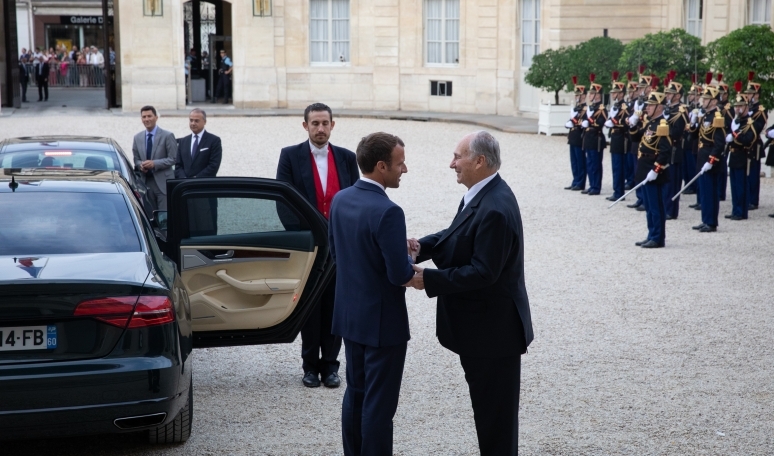 On September 18, President Macron received the Aga Khan at the Élysée Palace. 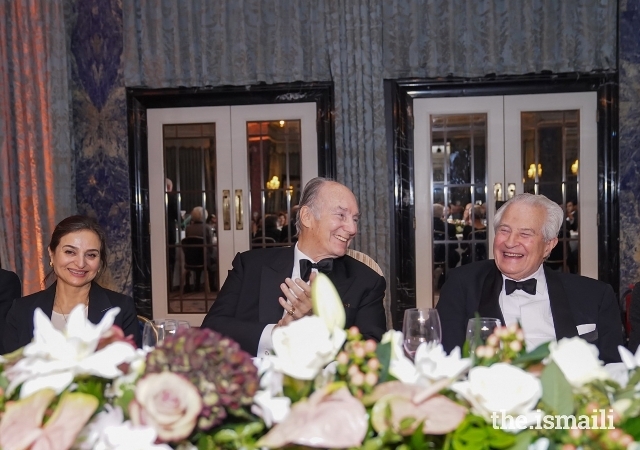 Mawlana Hazar Imam attended The Pakistan Society’s 65th Annual Dinner in London on Thursday 25 October. Founded in 1951 and based in London, The Pakistan Society is an international organisation that aims to increase public knowledge in Britain of the arts, history, geography, economic life, and institutions of Pakistan. Its patrons are HRH Prince Philip, The Duke of Edinburgh, and HE The President of the Islamic Republic of Pakistan. During the event, The Pakistan Society Award was presented to Shoaib Sultan Khan, the founding General Manager of the Aga Khan Foundation’s notable Rural Support Programme (AKRSP). 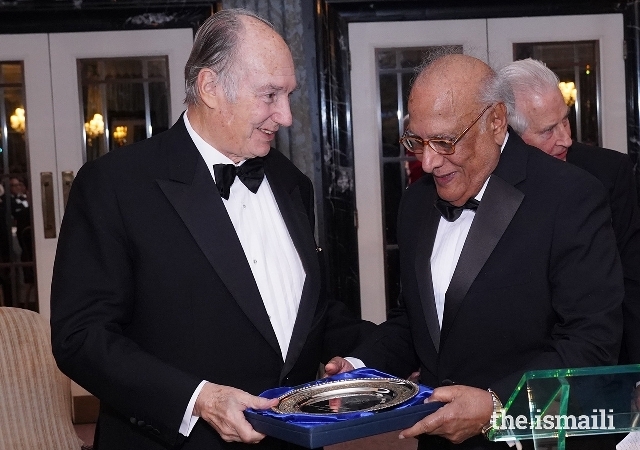 As the guest of honour, Mawlana Hazar Imam presented the award to Mr Khan. The award recognises those who have contributed significantly to the advancement of public knowledge and understanding of Pakistan in the United Kingdom. Mr Khan is considered a pioneer of rural development programmes in Pakistan, having served the government of Pakistan for 25 years, the Aga Khan Foundation for 12 years, and various agencies of the United Nations for 14 years. He also became a board member of the AKRSP in 1992, and is the only person to have served on the board since then. AKRSP was established by Mawlana Hazar Imam in 1982 to improve the quality of life of local village communities, primarily in Gilgit-Baltistan and Chitral. Speaking of his experiences with AKRSP, Mr Khan noted that the World Bank assessments of the AKRSP had shown that in the first 10 years, AKRSP had led to a doubling in the average income of the million people in Northern Pakistan. The approach is community-led, and encourages equitable social and economic development in the region. Today, AKRSP projects and programmes contribute effectively to sustainable development with a special focus on poor and vulnerable sections of society in Pakistan and elsewhere. Sir Nicholas Barrington, an honorary vice-president of The Pakistan Society, delivers the citation for The Pakistan Society Award, presented to Shoaib Sultan Khan. Mawlana Hazar Imam signs The Pakistan Society guest book. 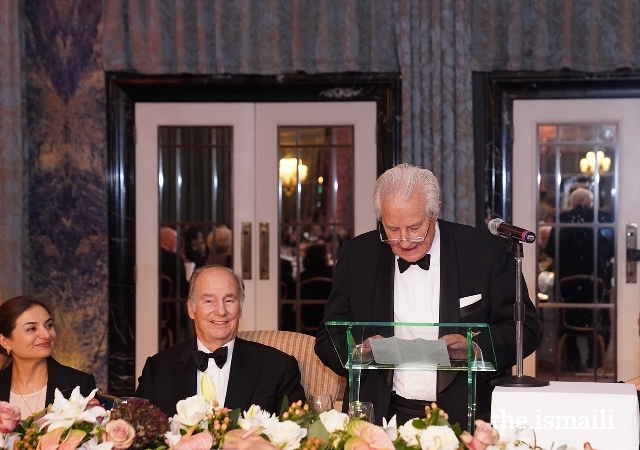 The former diplomat was speaking at the 65th annual dinner of The Pakistan Society at the Dorchester Hotel where His Highness Prince Karim Aga Khan was the chief guest. Pakistan’s Acting High Commissioner Ayub Khan, several leading Pakistani business professionals and officials of the Pakistan Society attended the dinner. Adam Thomson, Director of the European Leadership Network, warned that Pakistan’s population was growing rapidly and the government must formulate policies to provide jobs to youth. “My sons told me that population grew by 58% in 19 years. That’s an average four million extra Pakistanis per year. And the numbers will be higher each year in every single year to come unless fertility rate drops substantially. Over the next 19 years Pakistan’s population will grow up to 327 million, 120 million more Pakistanis than now, six million more Pakistan every year,” he said. He said that countries like Britain should do all they can to support Pakistan’s civil society. “In talking about supporting the civil society I am not talking just about funding as that’s the easy part. I am talking about supporting the civil society in helping government to deliver on the essentials that the growing Pakistani populations needs. Pakistanis business community for example can do and is doing really amazing things. But I am also talking about supporting civil society in holding both government and governance to account,” he said. He gave example of the Aga Khan Foundation and its linked organisations for their good work in development. The Pakistan Society Award for 2018 was presented at the dinner to Shoaib Sultan Khan. Sir Nicholas Barrington, Honourary Vice President of the Pakistan Society, in the citation address said that the award is being given to Shoaib Sultan Khan “an internationally renowned authority on rural development and alleviation of poverty, who pioneered schemes in the Northern Areas of Pakistan in association with the Aga Khan Foundation”. The President of Pakistan Dr Arif Alvi in his message to The Pakistan Society said that cordial relations between UK and Pakistan are anchored in history, democratic values as well as in a broad based partnership in the political, economic and cultural spheres. The Acting High Commissioner for Pakistan Muhammad Ayub said in his speech: “We are very delighted to have among us His Highness, The Aga Khan. His presence, indeed, is recognition of the good work of The Pakistan Society. 2018-11-11 H.H. The Aga Khan, Mowlana Hazar Imam, was among the 70 world leaders who attended in Paris, the ceremonies commemorating the 100 years of the Armistice that ended World War 1 - The Aga Khan attended the opening of the Paris Peace Forum which is scheduled from 11 to 13th November 2018. 2018, November 11: H.H. The Aga Khan, Mowlana Hazar Imam, attended the Paris Peace Forum. He can be seen here on the left of the photo, sitting second row. Also at the right of the photo, Canada Prime Minister Justin Trudeau, Germany Chancellor Angela Merkel, France President Emmanuel Macron, Portugal President Marcelo Rebelo de Sousa and many other heads of State and dignitaries. 2018-11-11 H.H. 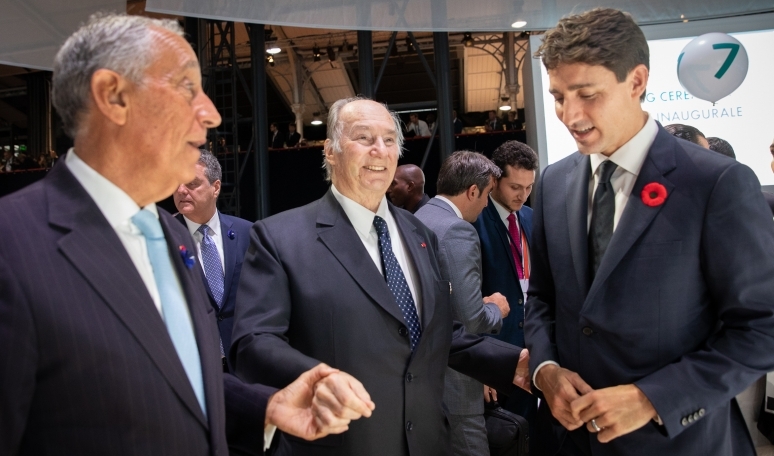 The Aga Khan met Prime Minister of Canada, Justin Trudeau at the Paris Peace Forum. Look at the few seconds video towards the end when they hug. 2018-11-11 H.H. 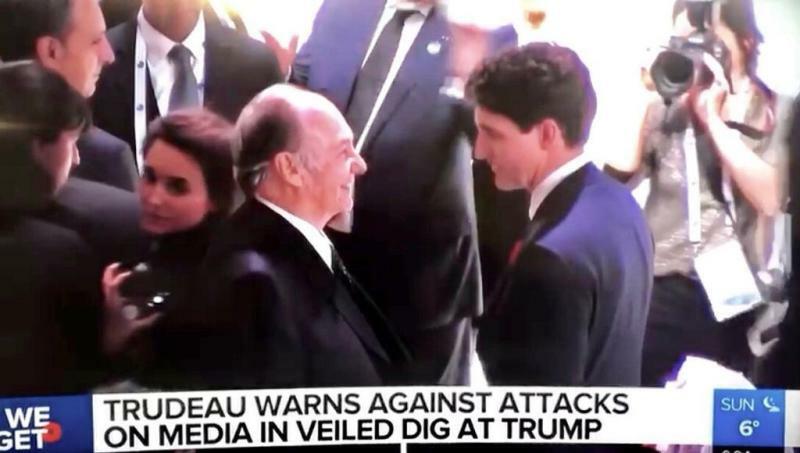 The Aga Khan met Prime Minister of Canada, Justin Trudeau. Look at the few seconds video towards the end when they hug. Mawlana Hazar Imam joined over 60 world leaders for the opening session of the inaugural Paris Peace Forum on 11 November 2018. Leadership from the French Jamat and AKDN were also present at the Forum. Initiated by French President Emmanuel Macron, the Forum is founded on the principle that international cooperation is key to tackling global challenges and ensuring durable peace. The Forum was launched on the 100th anniversary of the Armistice, marking the end of World War I. 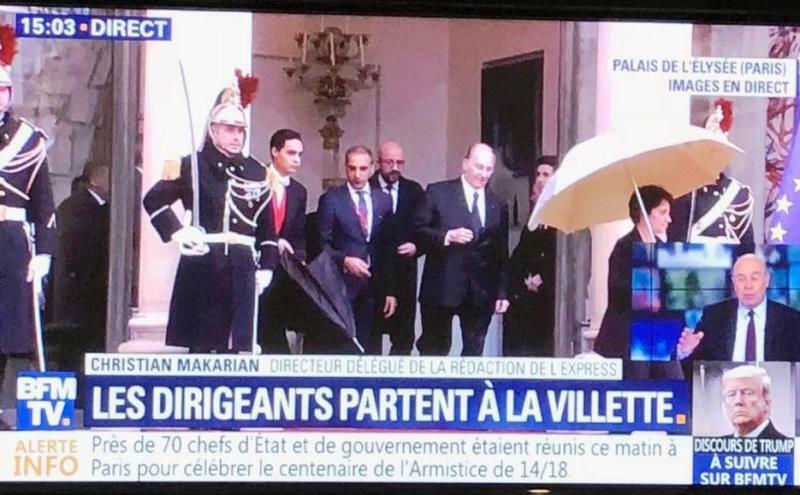 Earlier in the day, Hazar Imam was the guest of the French President at a luncheon held at the Elysee Palace for all the visiting heads of state and government. Hazar Imam has often spoken about the need to recognise pluralism as a fundamental value of human society, an essential ingredient in the development of a country and a necessity for the existence of a peaceful society. The promotion of pluralism has therefore been an aim of many AKDN programmes, from irrigation schemes bringing together diverse communities and cultures in Pakistan to inclusive reading programmes for children in Kenya, from a project to integrate immigrants in Lisbon to the reintroduction of midwifery schools in Afghanistan. AKDN’s ultimate aim is to nurture successful civil societies in which every citizen, irrespective of cultural, religious, or ethnic differences, can realise his or her full potential. To learn more about the Paris Peace Forum, visit parispeaceforum.org. 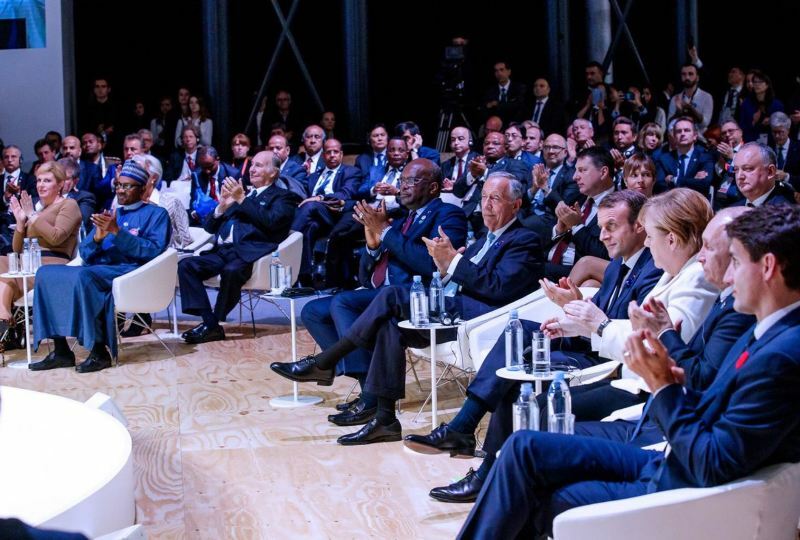 Paris, France, 11 November 2018 - His Highness the Aga Khan, founder and Chairman of the Aga Khan Development Network (AKDN), today joined over 60 world leaders for the opening session of the inaugural Paris Peace Forum. Initiated by French President Emmanuel Macron, the Forum is founded on the principle that international cooperation is key to tackling global challenges and ensuring durable peace. The Forum was launched on the 100th anniversary of the Armistice, marking the end of World War I. 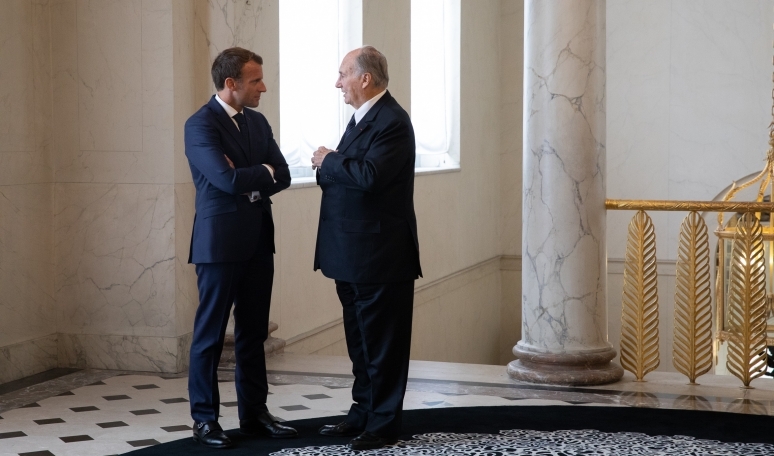 Earlier in the day, the Aga Khan was the guest of the French President at a lunch held at the Elysee Palace for all the visiting heads of state and government. The Aga Khan has often spoken about the need to recognise pluralism as a fundamental value of human society, an essential ingredient in the development of a country and a necessity for the existence of a peaceful society. The promotion of pluralism has therefore been an aim of many AKDN programmes, from irrigation schemes bringing together diverse communities and cultures in Pakistan to inclusive reading programmes for children in Kenya, from a project to integrate immigrants in Lisbon to the reintroduction of midwifery schools in Afghanistan. AKDN’s ultimate aim is to nurture successful civil societies in which every citizen, irrespective of cultural, religious or ethnic differences, can realise his or her full potential. 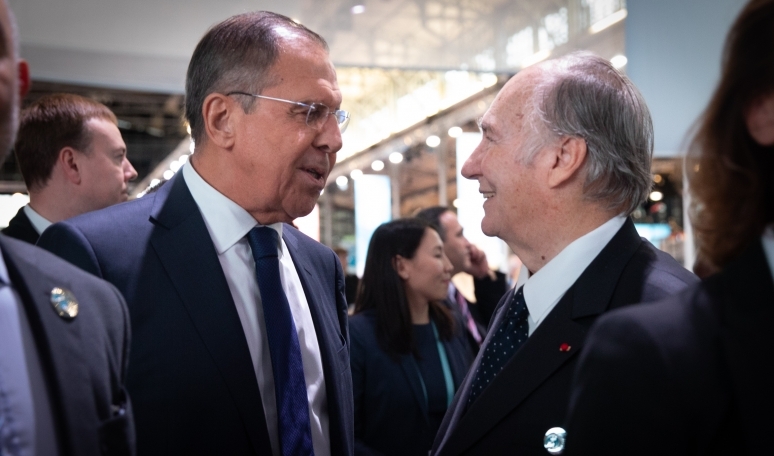 PHOTO 1: His Highness the Aga Khan greets Russian Foreign Minister Sergey Lavrov during the opening session of the inaugural Paris Peace Forum. 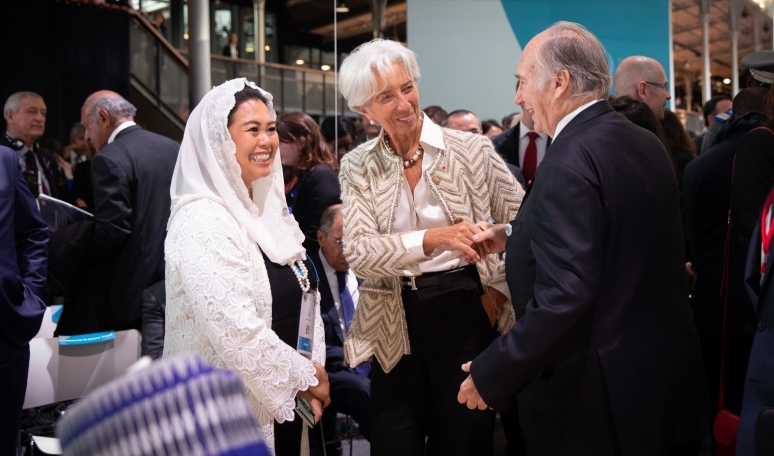 PHOTO 2: His Highness the Aga Khan greets Mrs Christine Lagarde, the Chairwoman of the International Monetary Fund. PHOTO 3: His Highness the Aga Khan was among over 60 world leaders for the opening session of the inaugural Paris Peace Forum. Here he greets President de Sousa of Portugal and Prime Minister Justin Trudeau of Canada. 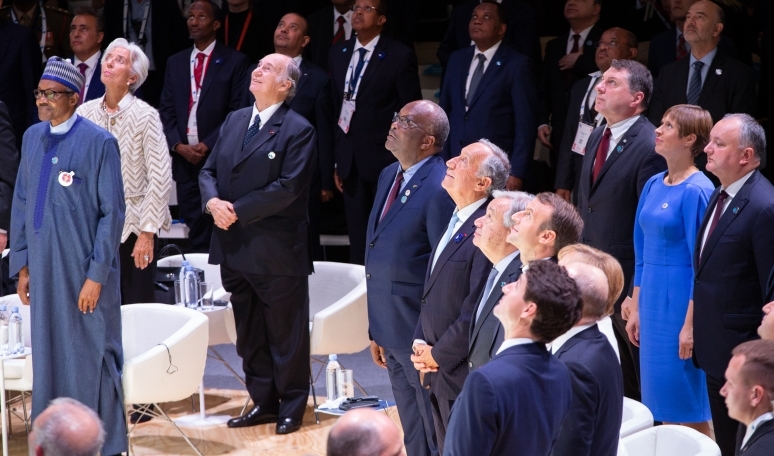 PHOTO 4: The world leaders gathered for the opening session of the inaugural Paris Peace Forum all look to the sky as an aerial photograph is taken to mark this historic event. 2019-03-11 TODAY! - H.H. 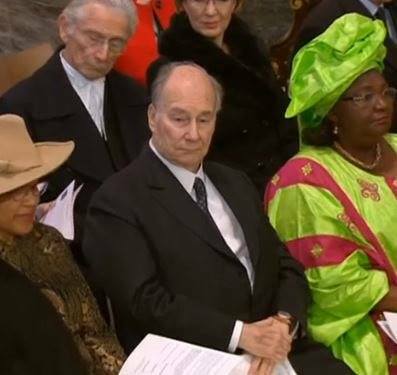 The Aga Khan at the celebrations for Commonwealth Day at Westminster Abbey in London, UK. Mowlana Hazar Imam was sited with utmost respect in the first row across the Queen, Prince Charles and other members of the British royal family. 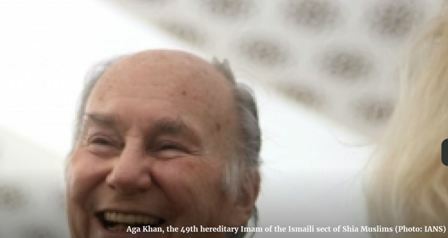 His Highness the Aga Khan is the 49th hereditary Imam of the Shia Ismaili Muslims and founder and chairman of the Aga Khan Development Network, which today works in 30 countries around the world to improve the quality of life of tens of millions of people. 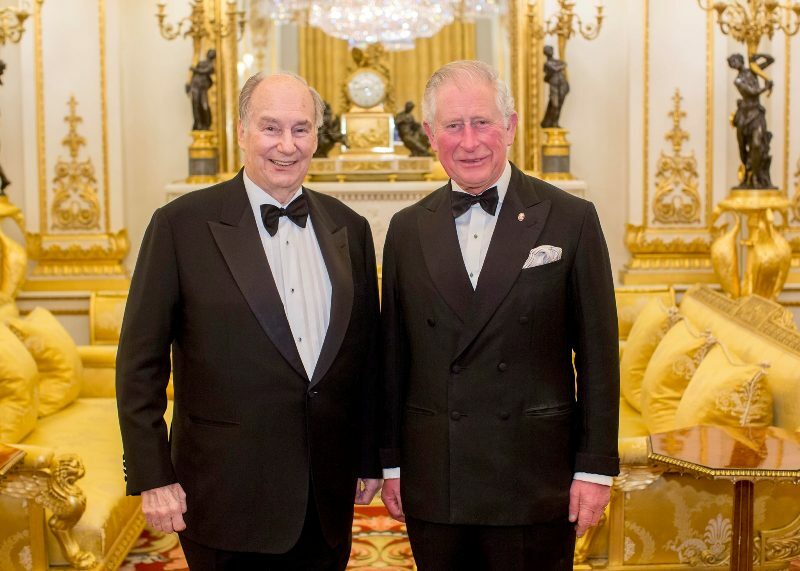 The Aga Khan met with The Prince of Wales at the dinner, where he was thanked for his support. Supporters of the charity’s work such as Amal and George Clooney, and long-term Ambassadors Benedict Cumberbatch and Sir Tom Jones, also joined the dinner at Buckingham Palace to celebrate the work of The Prince’s Trust around the world. The announcement comes at a time when The Prince’s Trust is expanding its work and network of expertise globally. As Global Founding Patron, His Highness will support the delivery of The Trust’s work in Canada, Australia, New Zealand and through local partners in India, Jordan, Pakistan, Malta, Barbados and Greece. Founded by His Royal Highness The Prince of Wales, The Prince’s Trust has been helping vulnerable young people across the UK since 1976, and is now helping to tackle the global issue of youth unemployment, and supporting young people and their communities to have more positive futures. Also among the dinner guests were Ambassadors Chiwetel Ejiofor, Luke Evans and Tinie Tempah who will be presenting awards to young people who have turned their lives around at The Prince’s Trust and TK Maxx & Homesense Awards tomorrow [Wednesday 13th March 2019]. Dame Martina Milburn DCVO CBE, Group Chief Executive said: “We are immeasurably grateful to His Highness the Aga Khan for his contribution to our work and are delighted to welcome him as Global Founding Patron." “It has been humbling and inspiring to take time tonight, with our dedicated supporters, to celebrate the success of our international work to date and look to a very exciting future." The Prince’s Trust Group includes the work of The Prince’s Trust in the UK alongside a network of charities; Prince’s Trust International, The Prince’s Trust Canada, The Prince’s Trust Australia and The Prince’s Trust New Zealand. All of the charities within The Prince’s Trust Group were established by HRH The Prince of Wales. Together, they are providing meaningful support for young people, military veterans, indigenous groups and environmental projects. 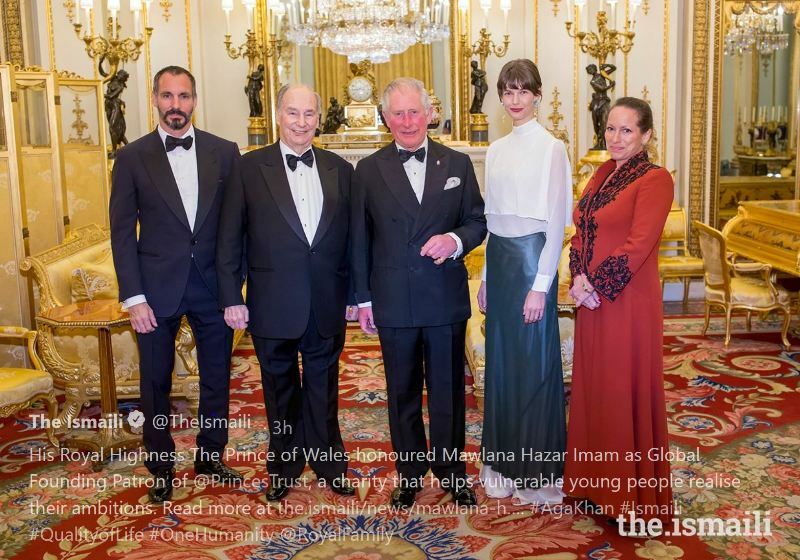 The Aga Khan, the 49th hereditary Imam of the Ismaili sect of Shia Muslims, has been named the Global Founding Patron of the Prince of Wales's charitable trust. "Founded by His Royal Highness, The Prince of Wales, The Prince's Trust has been helping vulnerable young people across the UK since 1976, and is now helping to tackle the global issue of youth unemployment, and supporting young people and their communities to have more positive futures," it said. The Aga Khan met Prince Charles at the Buckingham Palace, where he was thanked for his support. Supporters of the charity's work such as Amal and George Clooney, and long-term Ambassadors Benedict Cumberbatch and Sir Tom Jones were also present. The announcement comes at a time when the Prince's Trust is expanding its work and network of expertise globally. 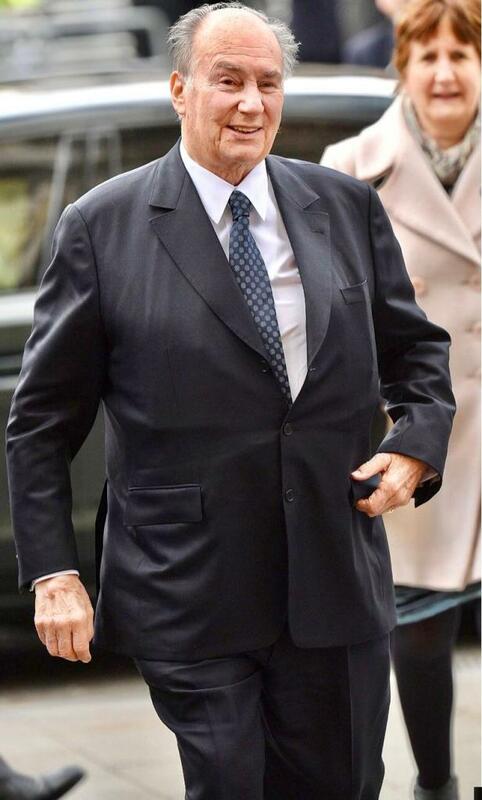 London, March 13 (IANS) The Aga Khan, the 49th hereditary Imam of the Ismaili sect of Shia Muslims, has been named the Global Founding Patron of the Prince of Wales's charitable trust. Aga Khan offers 2 paintings to the National Museum in Portugal. 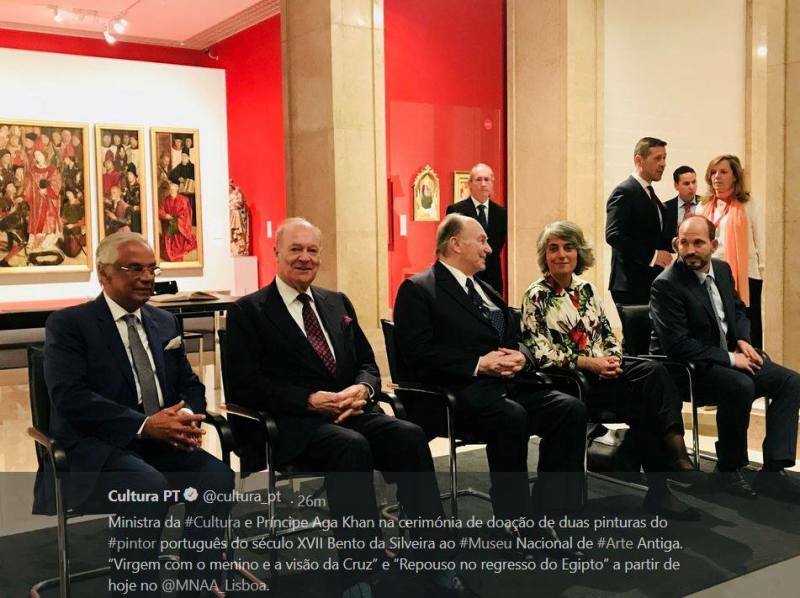 Lisbon, Portugal - 2019, March 29: Minister of Culture and Prince Aga Khan at the donation ceremony of two paintings of the 17th century Portuguese artist Bento da Silveira to the National Museum of Ancient Art. "Virgin with the boy and the vision of the Cross" and "Rest on the return of Egypt". Prince Amyn and Prince Hussain accompanied Mowlana Hazar Imam. MINISTER OF CULTURE HIGHLIGHTS THE ROLE OF CULTURE FOR "SOCIAL COHESION AND PEACE"
The curator of the culture folder was speaking at a ceremony to deliver two paintings by the painter Bento Coelho da Silveira (1617-1708) to the National Museum of Ancient Art (MNAA) donated by Imamat Ismaili and the Aga Khan Development Network. "We live in challenging times, and we have to pass on our culture and history to the next generations, so that times do not regress," said the minister, underscoring the cooperation between the Portuguese state and that community. 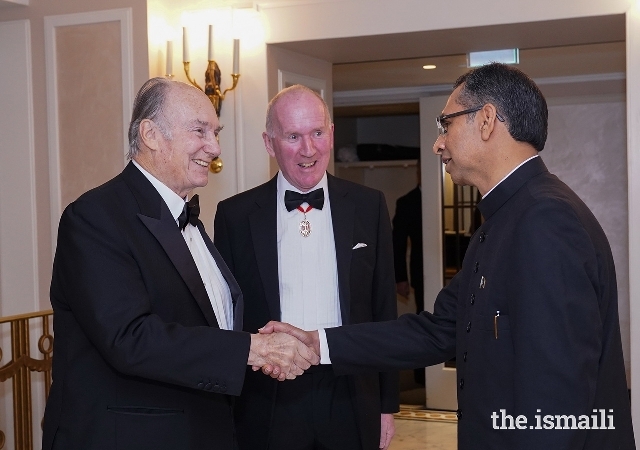 The ceremony was attended by Aga Khan, the 49th hereditary Imam and spiritual leader of the Ismaili Shiite Muslims, his brother, Prince Amyn Aga Khan, the director of the National Museum of Ancient Art, António Filipe Pimentel, and a few dozen guests. From the royal painter of D.Pedro II, besides the two works destined for the National Museum of Ancient Art, in Lisbon, there will be another one for the Soares dos Reis National Museum, in Porto. 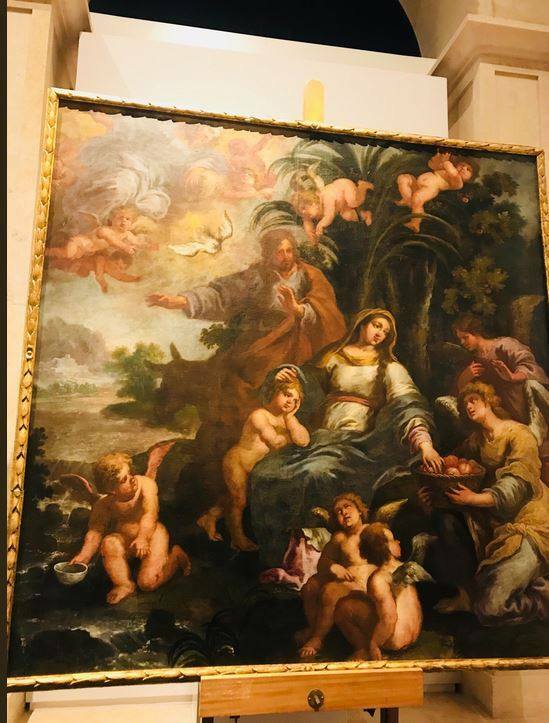 At the National Museum of Ancient Art, the paintings "Rest on the return of Egypt" and "Virgin with the boy and the vision of the Cross" were handed over to the National Museum of Soares dos Reis. Temple". "This donation shows that we can work together so that art can be accessible to the public domain," said Grace Fonseca, in her speech in English, like the other speakers, arguing that "paintings should be seen by people, and be a vehicle to tell the history and culture of a country. " The minister also thanked "the work that Aga Khna has done in Portugal over the years", in particular in social inclusion projects, and with the communities. For his part, Prince Amyn Aga Khan said that the donation in question "is a reflection of the commitment to be part of the cultural life of this country." 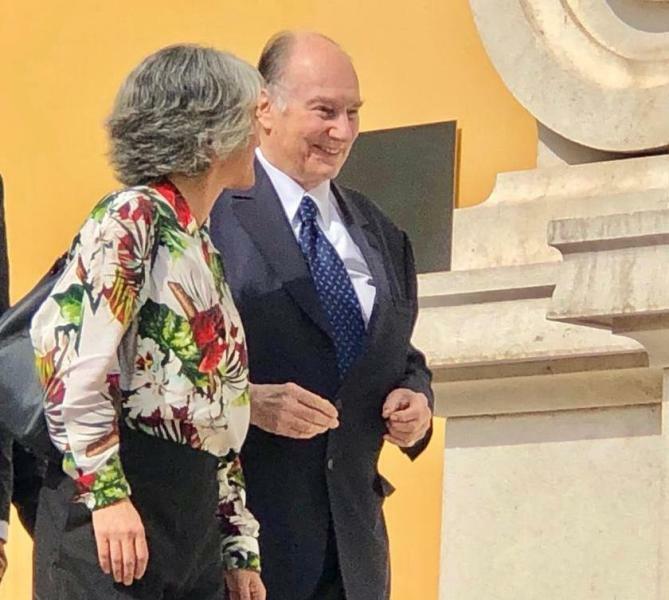 "The paintings were originally in the Palacete Mendonça [in Lisbon, acquired to create the new headquarters of the Ismaili community], and we decided that they should be accessible to the general public," he explained. "We felt it would be the ideal place for these two paintings," added the prince, speaking also on behalf of his brother, who did not speak. On the other hand, Amyn Aga Khan made a point of thanking the director of the MNAA, António Filipe Pimentel, for his activity as director of that institution, which should leave in June, after having decided not to re-apply for the place. "One of my intentions was to thank my friend, for the excellent work he has done in the museum for the last ten years, and for his team. My congratulations, "he said. 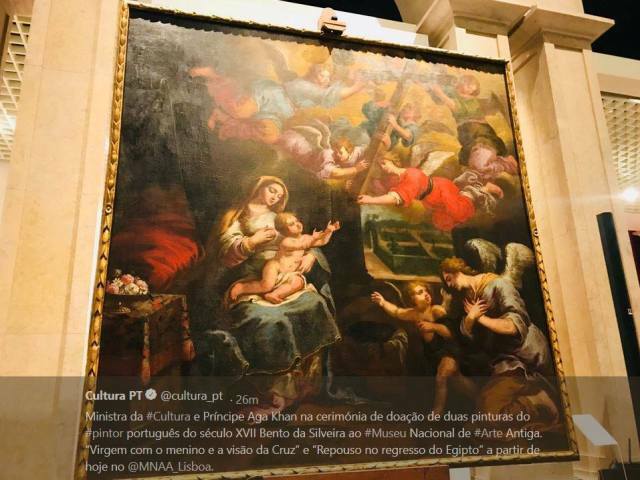 He added: "As Portugal is not only Lisbon, it is also Porto, and other cities, we decided to donate a third painting to the Soares dos Reis National Museum." He also recalled the support that the Aga Khan Foundation gave to the acquisition, in the public campaign "Let's put the Sequeira in the right place", from the painting "Adoração dos Magos", by Domingos Sequeira, from 1828. The Aga Khan Foundation supported, at that time, the purchase of the work with 200 thousand euros, one third of the total value by which it was acquired for the museum in 2016. "This campaign has shown that there is public support for culture in this country. We want to be part of this support, "he said. After observing the two donated works, the two Aga Khan princes were taken by the director of the museum to appreciate "Adoration of the Magi", which they considered "sublime". For his part, António Filipe Pimentel, thanked the "generous donation" from the Ismaili community of the two new works, pointing out that "they will be exhibited with the dignity they deserve", in the one in the museum. The entities agreed in 2015 with the Portuguese State to set up the world headquarters of Imamat Ismaili in Lisbon.